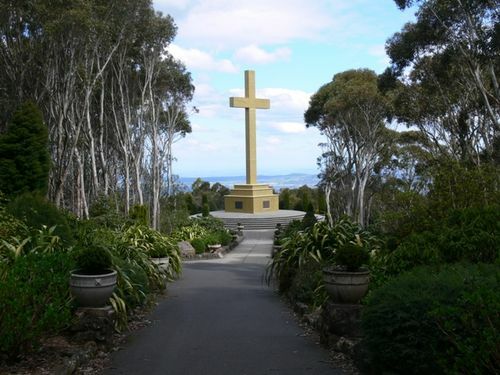 The 21 metre high Memorial Cross was erected by a private citizen, Mr William Cameron, in the 1930`s to commemorate those who died in World War One and to provide work for the unemployed in the depression. It is considered Victoria`s most significant war memorial after the Shrine. Today the reserve commemorates all those who served in wars and conflicts. On the highest point of Mount Macedon about 400 persons gathered in a bitter wind and wintry rain on Saturday afternoon around the base of a great memorial cross which was dedicated by the Premier (Sir Stanley Argyle) to the glory of God and to the memory of Australia's gallant soldiers who laid down their lives in the Great War. The cross of stone and the two and a half miles of road leading up the mountain cost £10,000, all of which, except about £200, which was contributed by the Gisborne Shire, was paid by Mr. W. Cameron, of Cameron Lodge, Macedon. Seventy feet in height, with a plinth 14 feet in width, the cross rests on a circular base 30 feet in diameter. The pale yellow stone, in relief against the sombre color of the dense bush, is conspicuous for miles across the plains 2,000 feet below. On two sides of the cross great swords in relief point towards the ground. About the circular base are trim lawns, shrubs and seated recesses in rock. Chronicle (Adelaide), 21 March 1935. The Memory Of Their Gallant Deeds"
The elements of nature took their toll on the original cross, which deteriorated to the extent that it became unsafe. It ws demolished and replaced by a matching cross in pre-cast concrete in 1995. This plaque is placed to perpetuate the expression of gratitude of the Victorian people to Mr William Cameron.